Lincoln Center may look more like an archeological dig these days than a setting for an elaborate party. But despite the ubiquitous construction crews, equipment, and scaffolding that seem like permanent fixtures around the city’s largest arts complex, Lincoln Center for the Performing Arts is throwing itself a yearlong party to celebrate its 50th birthday. 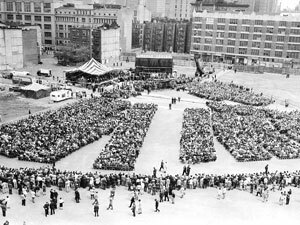 The groundbreaking ceremony for Lincoln Center took place on May 14, 1959. The buildings behind the stage are on 65th Street, where The Juilliard School now stands. From May 2009 through May 2010, hundreds of special performances, exhibits, community activities, and other events will take place around the Lincoln Center campus, at its venues both indoors and out. When U.S. President Dwight D. Eisenhower broke ground for Lincoln Center on May 14, 1959, the idea of a prominent performing arts center in what was then a neighborhood known more for urban blight than for operas, orchestras, and ballets, was almost radical. The plan was for Lincoln Center—which was incorporated in June 1956, with John D. Rockefeller 3rd as its president—to be a catalyst for urban renewal and help restore economic and cultural vitality to the Upper West Side. Since that time, the neighborhood has underdone a major transformation and has boomed, and Lincoln Center has become a model for performing arts centers around the world. To get the birthday party rolling, on May 11, 2009, a special program commemorating the original groundbreaking ceremony will take place in the newly refurbished Alice Tully Hall and will feature both established and up-and-coming artists. Attending will be top elected officials, performing artists, civic and community leaders, and representatives from Lincoln Center’s 12 resident organizations. The celebrations will end in May 2010 with a campus-wide open house. In between will be myriad performances and events of note. Here at Juilliard, two special programs are planned. In October 2009, there will be a chamber music concert commemorating the 40th anniversary of the opening of the Juilliard building. (Although Juilliard became a constituent of Lincoln Center in 1957, the School did not move to its present location until October 1969.) In April 2010, the U.S. premiere of Kommilitonen!, a new opera by Sir Peter Maxwell Davies, will be presented. It was co-commissioned by Juilliard and the Royal Academy of Music in London, where it will receive its world premiere the preceding February. Other highlights include a free concert by cellist Yo-Yo Ma and his Silk Road Ensemble on June 9, 2009, to inaugurate the newly renovated Guggenheim Bandshell in Damrosch Park; an evening of new works by Emanuel Gat Dance, commissioned and presented by Lincoln Center Festival for its 2009 season; New York City Opera’s re-creation of Philip Glass and Robert Wilson’s groundbreaking opera Einstein on the Beach, to be staged in the newly renovated New York State Theater; Metropolitan Opera performances during the 2009-10 season of works that have been in the company’s repertory for 50 years or more, including Il Barbiere di Siviglia, Hamlet, Aida, Der Fliegender Holländer, Le Nozze di Figaro, and many others; a New York City Ballet festival of new choreography and music commissioned from an international array of choreographers and composers; a New York Philharmonic concert featuring music commemorating the anniversary; a 10-concert series of the complete Beethoven string quartets, violin sonatas, and cello sonatas at the Chamber Music Society; Jazz at Lincoln Center Orchestra’s reprise of Portrait in Seven Shades, a commission by orchestra member and saxophonist Ted Nash, and a Fats Waller festival celebrating the 105th birthday of the legendary New York pianist; and two 50-hour film marathons presented by the Film Society of Lincoln Center, the first, over the Fourth of July (2009) weekend, focusing on film musicals, and the second, over the Labor Day weekend, showing classic foreign films. Offstage, there will be special exhibits, symposia, and community events. An exhibit exploring the development and impact of Lincoln Center will be on view from October 15, 2009, to January 16, 2010, at the New York Public Library for the Performing Arts, and a corresponding exhibit at Juilliard’s Lila Acheson Wallace Library is planned for the spring 2009 semester. Artists, students, and employees of Lincoln Center’s resident organizations will be able to share memories and stories when StoryCorps, the national project that collects and preserves the history and unique stories of everyday Americans, sets up a mobile recording studio on the plaza in spring 2009. Amidst the performances and festivities, Lincoln Center’s elaborate $1.2 billion redevelopment project will continue. The target completion date is 2011, though some major portions of the work—including the renovation of The Juilliard School, Alice Tully Hall, and the fountain plaza—will be almost, if not completely, finished by May 2009. For full details about Lincoln Center’s 50th anniversary, visit the center’s Web site at lincolncenter.org.